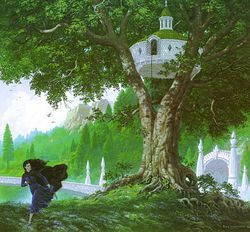 The greatest tree in Neldoreth, Hírilorn (S. ‘Lady-tree’ or ‘Tree of the Lady’) was a three-trunked beech which grew in the forest of Neldoreth near the city of Menegroth, and in which Lúthien Tinúviel was imprisoned by her father, King Thingol, to prevent her from following Beren. 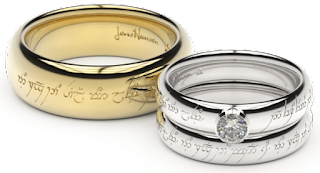 However, Lúthien managed to escape, following Beren and helping him recover one of the Silmarils from Morgoth’s crown. During the Hunting of the Wolf, Beren was mortally wounded by Carcharoth, and died under Hírilorn in Lúthien’s arms.